I was eating these things before they were cool. No, seriously. 11 or 12 years ago, when I was trying to discover the cause of my clinical depression, I went through a number of food-related adventures. One of the things I tried was a raw-food diet. I found that raw-foodism didn’t work for me as a way of life, but I did get some really delicious recipes out of the experience. These date-and-cocoa truffles are at the top of that list. I haven’t made them in a while, but I wanted to blog about them today. So I looked for the recipe… and of course I couldn’t find it. “To the Internet!” I said to myself, and searched for “raw food truffles”, hoping that maybe someone had recorded this obscure recipe for future reference. Did I say “obscure”? Apparently I should have said “ubiquitous”. This recipe is all over the place. It’s got a hundred different variations. It’s popular. It’s trending. And I find it just as delicious as it was 12 years ago. If you want to make these truffles – and trust me, you want to make them – Chinmayie of Love Food Eat has blogged the recipe, with some gorgeous pictures of the finished product that’ll give you cravings. 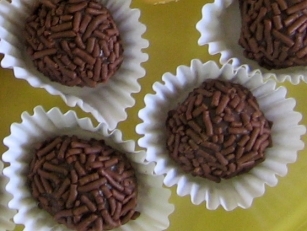 The only ingredients are dates, cocoa, optional flavourings, and optional garnishes to roll the truffles in. They’re so easy to make; and they taste better than any commercial chocolate truffle I’ve ever paid far too much money for. They’re even, for heaven’s sakes, nutritious. Click here for the recipe. And then go make some. Even when you’re ahead of the curve you’re behind the curve. What’s a bloggers to do? This entry was posted on April 18, 2013 by thinkreadcook and tagged candy, chocolate, cocoa, dates, food, healthy, hipster, homemade, nutrition, raw food, recipe, sweets, truffles.